US Ambassador to Qatar Dana Shell Smith was among the demonstrators. Attending student event in #Qatar honoring innocent lives lost, good to see young people rejecting hate of all kinds. At the end of the march, the protesters watched a video message from Suzanne and Farris Barakat, the brother and sister of one of the murder victims. 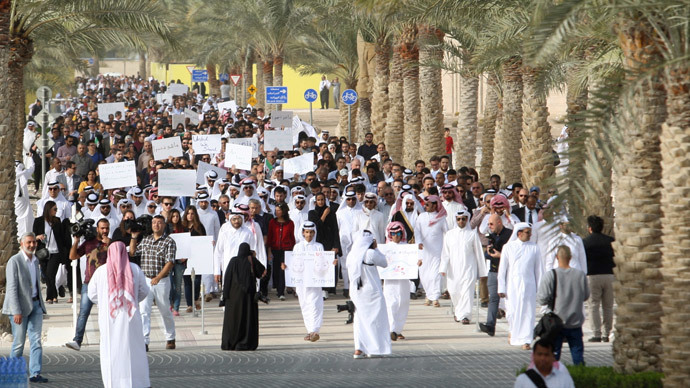 The march was organized by a foundation headed by the mother of Qatar's emir, Sheikha Moza bint Nasser al-Masnad. Last week, three students – 23-year-old Deah Shaddy Barakat, his 21-year-old wife Yusor Mohammad Abu-Salha and her 19-year-old sister Razan – were allegedly murdered by their white neighbor Craig Stephen Hicks. The killing happened in the North Carolina university town of Chapel Hill. Hicks, 46, has been charged with three counts of murder, and is thought to be a fierce opponent of religion: on his Facebook page, he published anti-religious posts, including against Islam, Christianity and Mormons. According to police, they are looking into the incident as a parking dispute. However, the students’ families believe the attack was religiously-motivated.